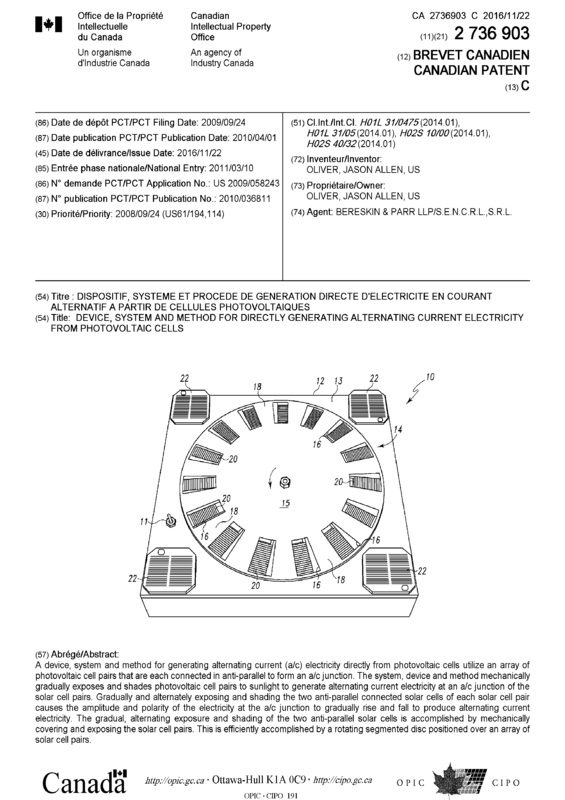 A device, system and method for generating alternating current (a/c) electricity directly from photovoltaic cells utilize an array of photovoltaic cell pairs that are each connected in anti-parallel to form an a/c junction. The system, device and method mechanically gradually exposes and shades photovoltaic cell pairs to sunlight to generate alternating current electricity at an a/c junction of the solar cell pairs. Gradually and alternately exposing and shading the two anti-parallel connected solar cells of each solar cell pair causes the amplitude and polarity of the electricity at the a/c junction to gradually rise and fall to produce alternating current electricity. The gradual, alternating exposure and shading of the two anti-parallel solar cells is accomplished by mechanically covering and exposing the solar cell pairs. This is efficiently accomplished by a rotating segmented disc positioned over an array of solar cell pairs. phase synchronizer that is incorporated into the device. The ACSG has single or three phase capabilities. The ACSG works on the same principle as any regular generator except it is completely solar powered. Solar cells on the perimeter, power a DC motor that spins the disc. The disc speed is regulated by a phase synchronizer, which adjusts the motor speed to match any input phase signal. AC current is directly created when the cells are alternately exposed to light, by the circulating disc through our patented system. No inverter, batteries or heavy wiring are needed. We believe the ACSG has multiple applications. The ACSG is designed to be a supplemental power system for residential, commercial, or to input power to the grid system. Multiple ACSGs could be assembled in a modular pattern to create the most efficient sized panels. We believe the units could be sold in a “carry out” version from retail stores for consumer use. Commercial projects could be designed and installed to supplement power for commercial and manufacturing facilities or for solar power generating stations providing power to the grid system. With single and three phase capabilities, all of this is very feasible. cost, comparison of each unit and the combined units would be more easily determined. installation costs and maintenance costs for the life of the system. • Heavy gauge wire is needed to carry DC current. • The ACSG directly produces AC current eliminating the need for any inverters. power will far exceed existing systems. 1. 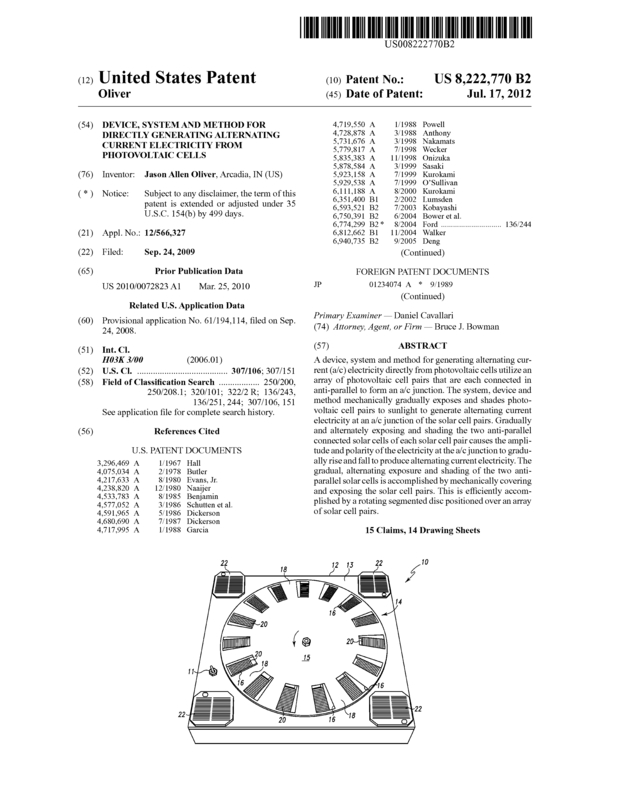 U.S. Patent 8,222,770 issued July 17, 2012 (device). 2. U.S. Patent 8,492,929 issued July 23, 2013 (method). 3. Canadian Patent application No. 2736903 is pending. 4. 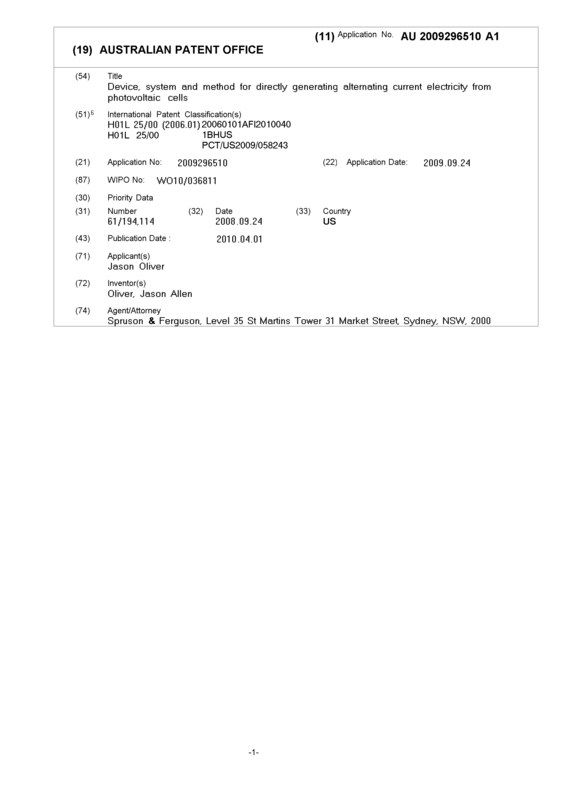 Australian Patent application No. 2009296510 recently approved, awaiting documentation. 5. European Patent application No. 09816859.4 is pending. 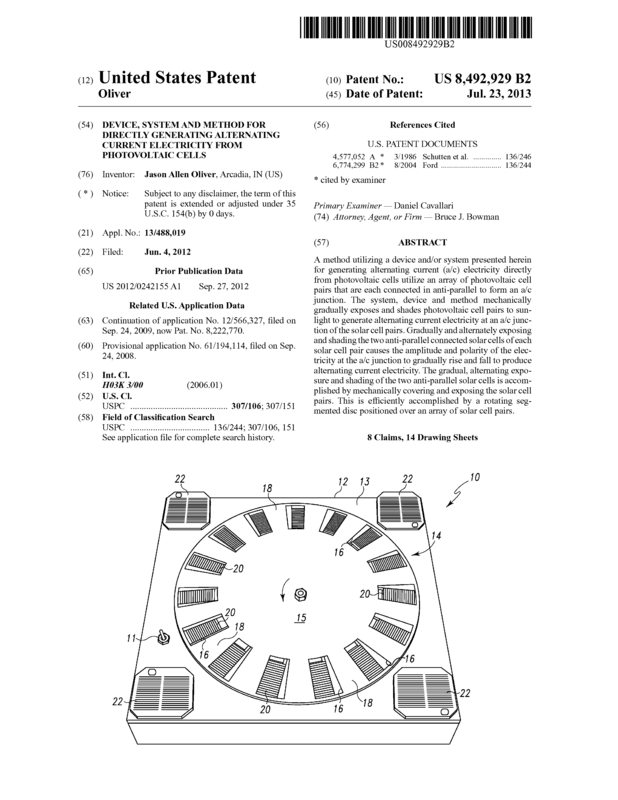 Page created at 2019-04-26 6:14:17, Patent Auction Time.